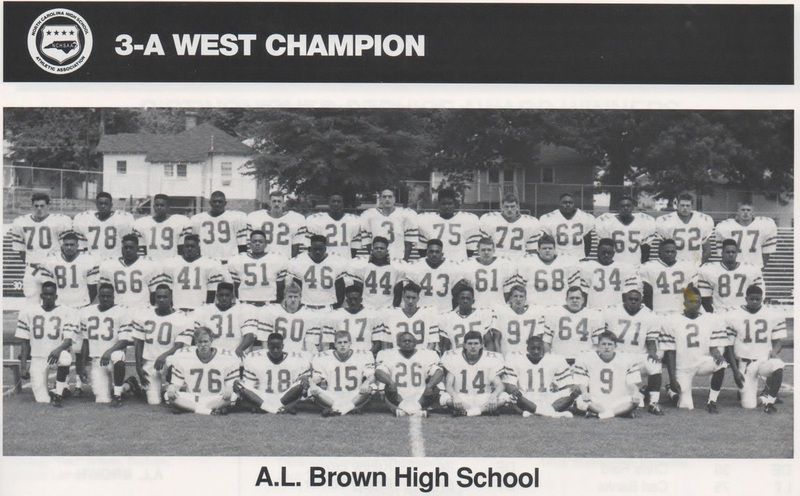 "The 1991 A.L. Brown Wonders"
Never before had the Wonders and Spiders met twice in the same year. 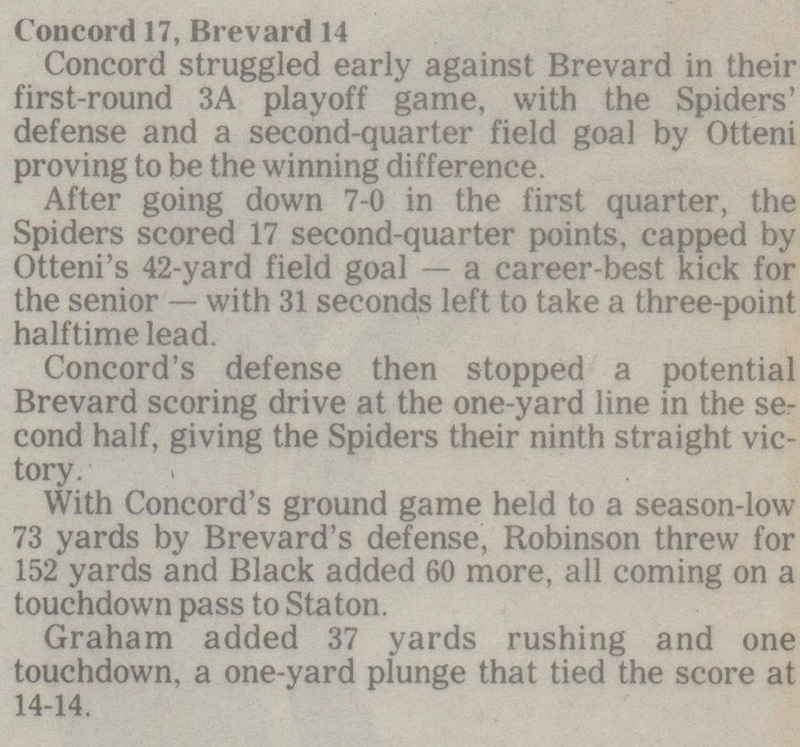 Never before had the Wonders and Spiders met in a playoff game. 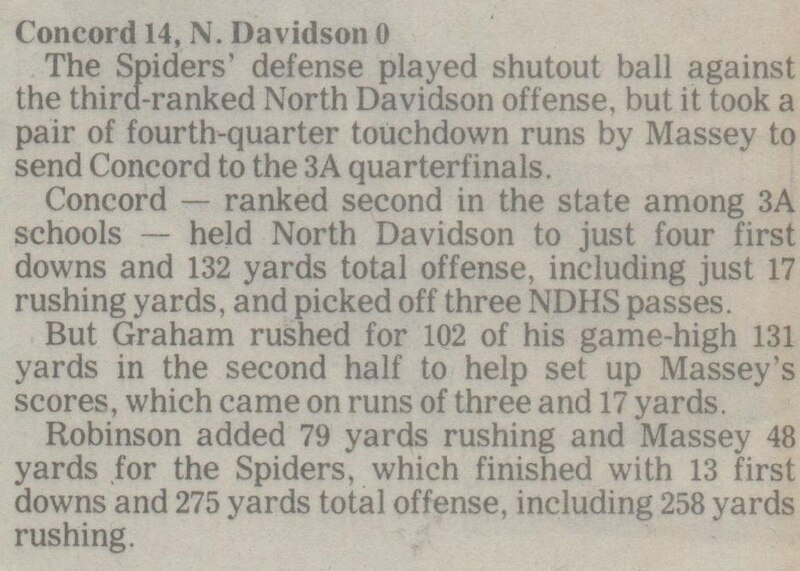 Never before had the Wonders and Spiders met in a playoff game that decided the Western North Carolina Champion. 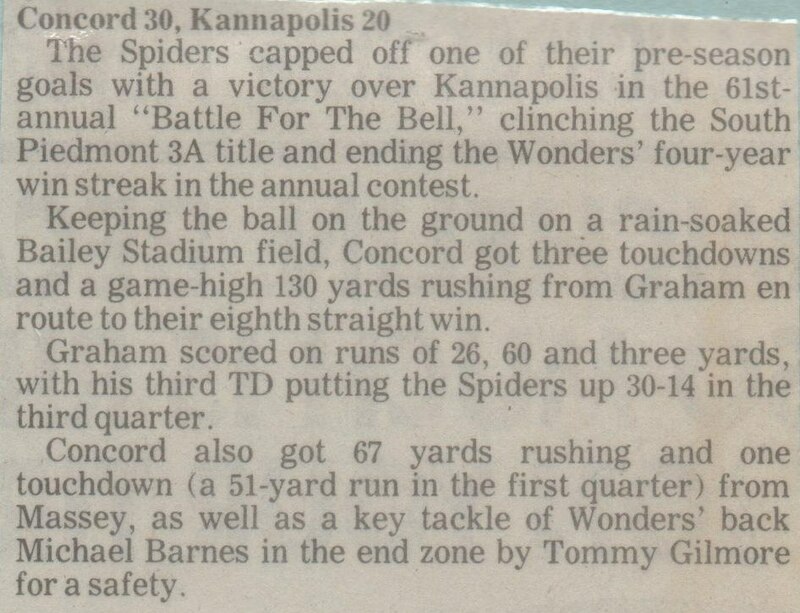 A whole boatload of firsts came with this semi final round match up between the Wonders and Spiders at Concord's Robert C Bailey Stadium. 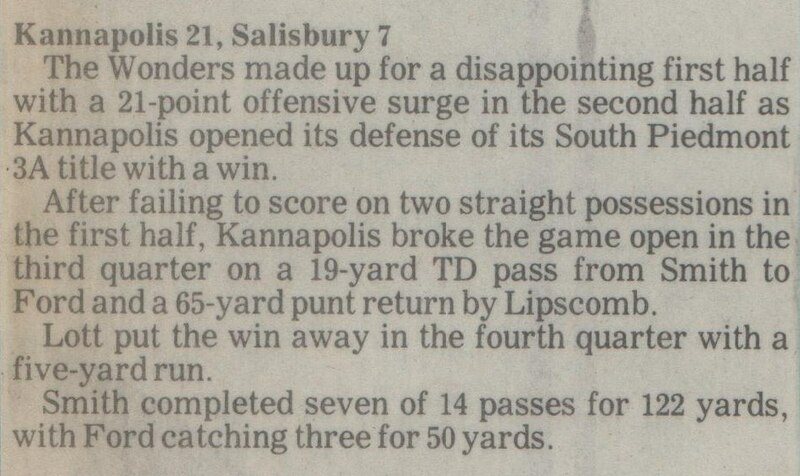 This game would be a forecast of things to come in the South Piedmont Conference 3A in the nineties. 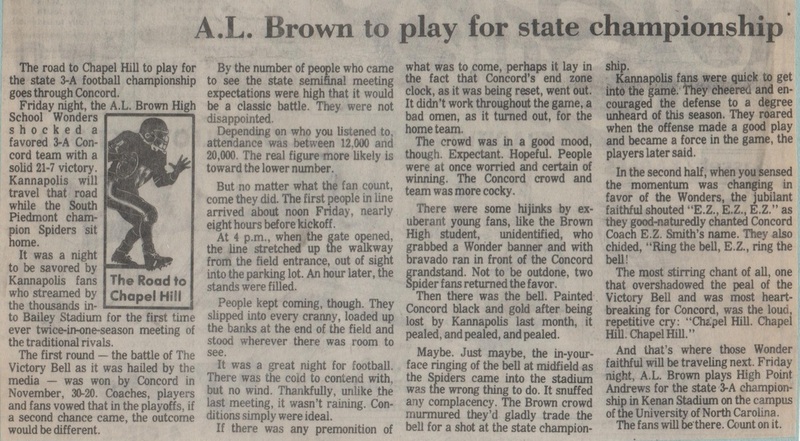 The Wonders and Spiders have met in some real bell ringers in the Battle for the Bell game over the last several decades, but the semi final round match up in 1991 would prove to be the proverbial one for the record books. 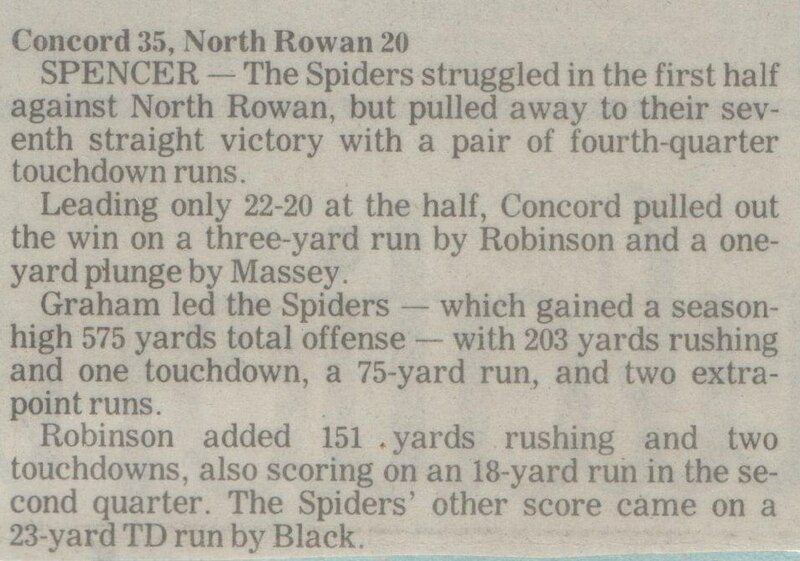 "The TV-13 Game of the Week"
The Concord Spiders would record the first points of the game on this five yard TD run on 4th and one by Spider back Jay Graham. 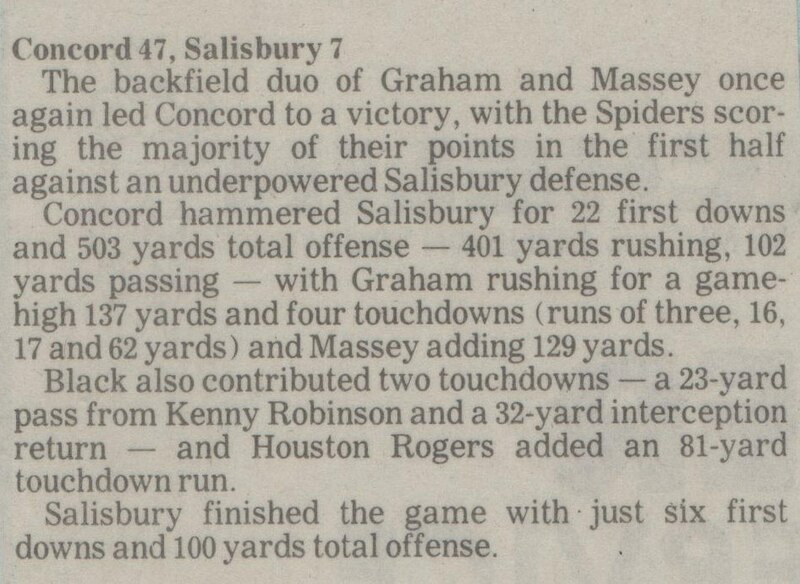 With 11:03 left in the first half the Spiders would lead 7-0 over the Wonders. 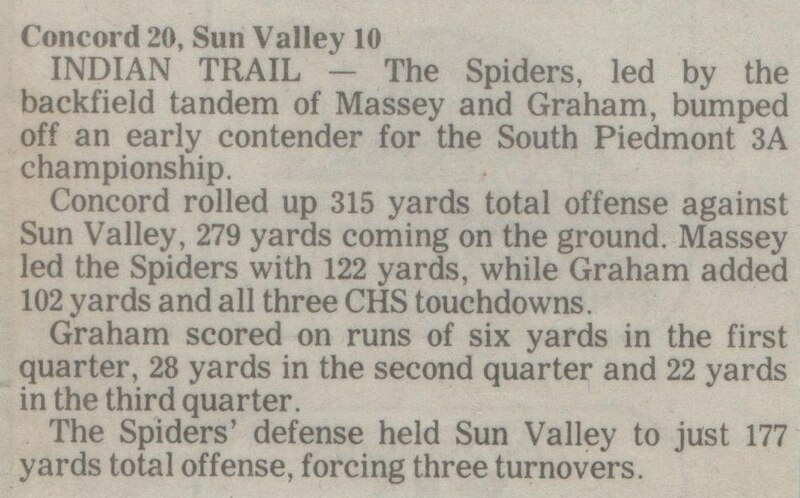 This lead would take the Spiders into halftime. 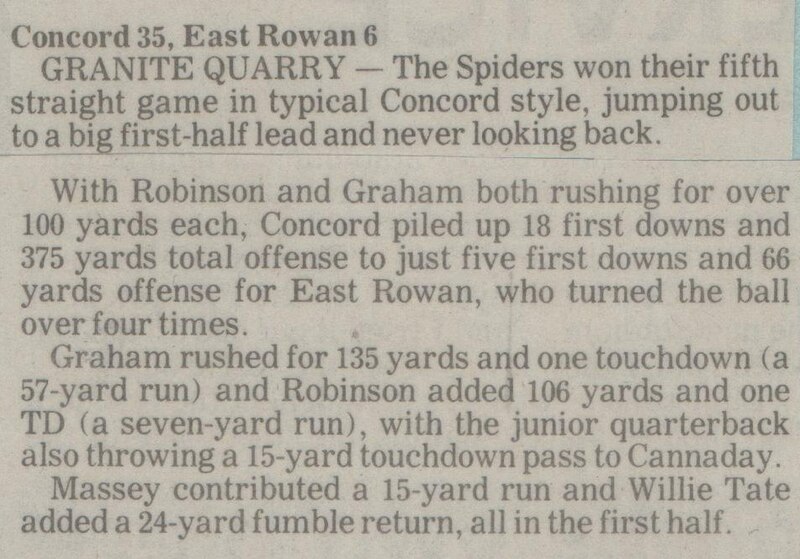 Early in the second half Wonder back Keenan Lott finds a seam in the middle and scampers sixty one yards setting the Wonders up first and goal at the one yard line. 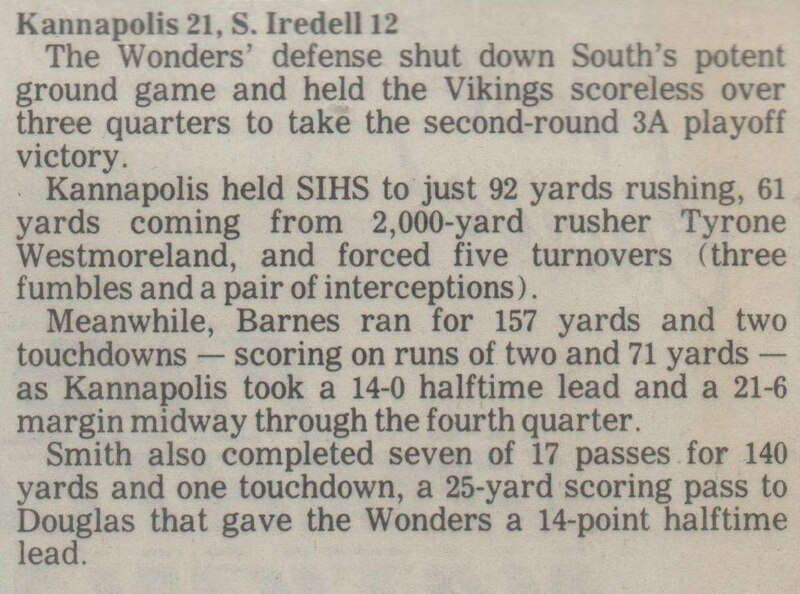 This would set up the tieing score two plays later by Michael Barnes. 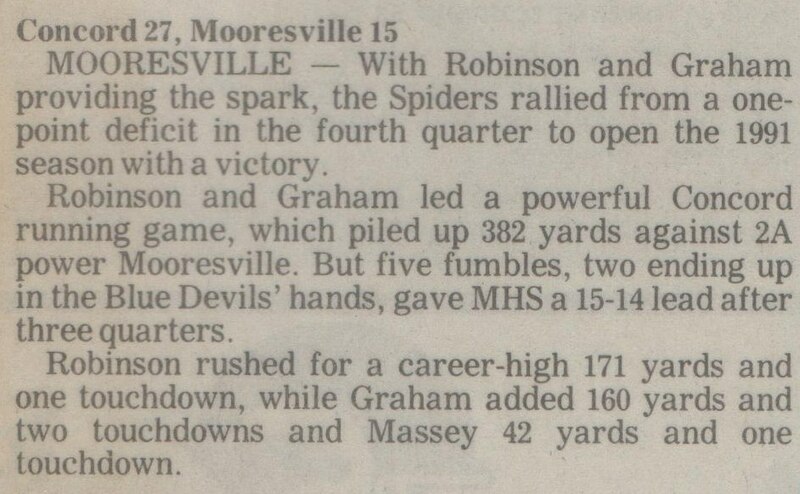 Midway through the third quarter on second and goal Michael Barnes rumbles through the Spider line on this one yard touchdown run to put the Wonders on the board. 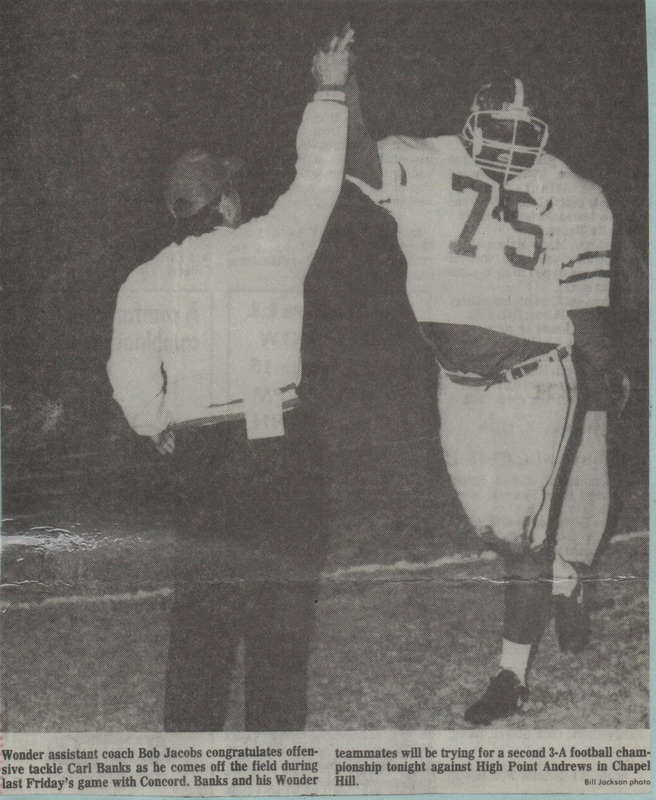 The PAT would be true and the game would be tied at seven all. 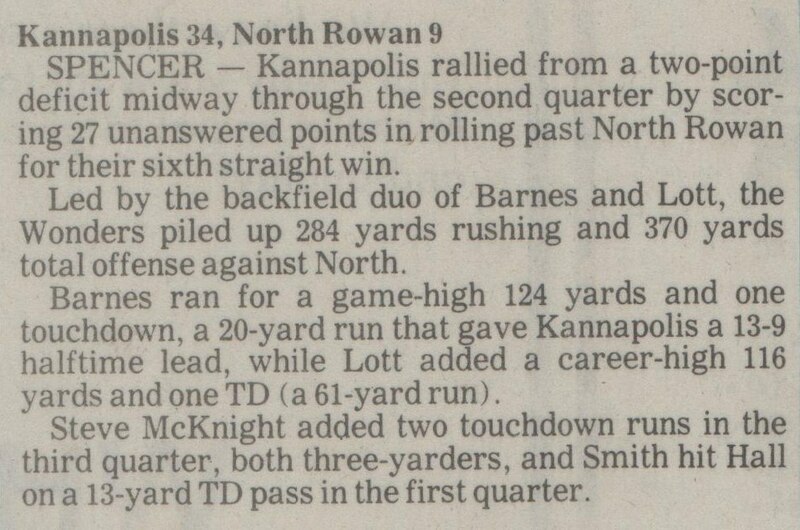 On the first play of the fourth quarter Wonder runningback Keenan Lott breaks off a thirty yard jaunt to the left sideline setting the Wonders up with first and goal at the seven yard line. 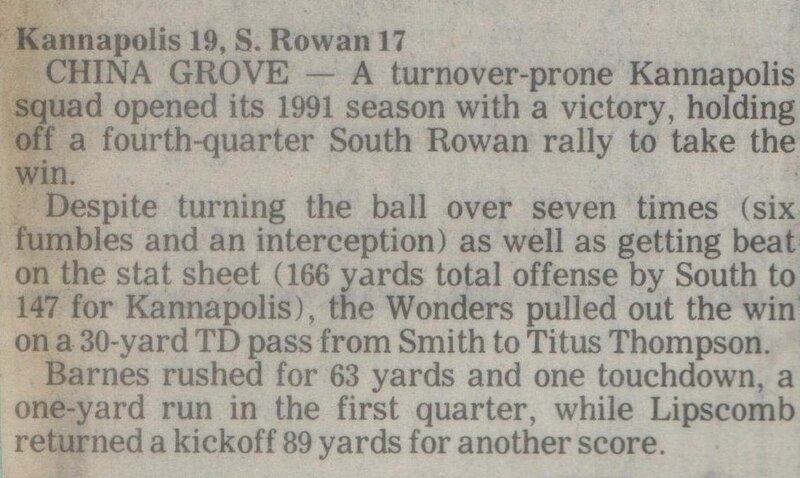 Two plays later on third and goal Michael Barnes pushes it in the final four yards for the touchdown putting the Wonders ahead. 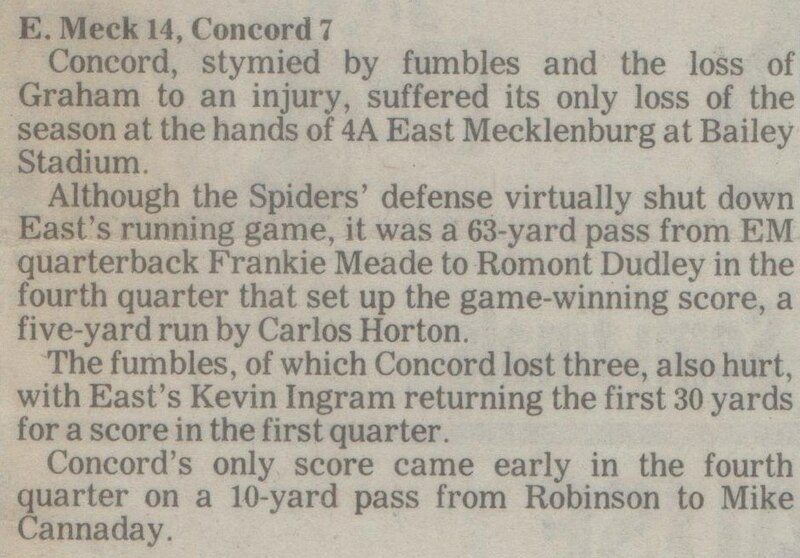 The PAT by Ben Johnson would be good and the Wonders would lead the Spiders 14-7 early in the fourth. 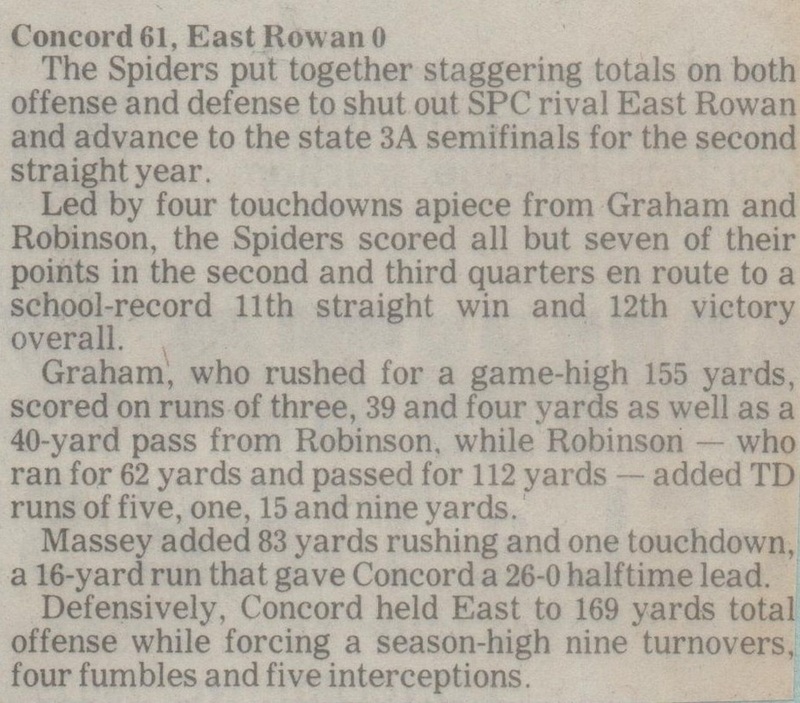 The Spiders unable to move the ball punted the ball back to the Wonders with just under 3:17 left in the game. On the second run from scrimmage Michael Barnes finds a seam and busts loose on a 70 yard run setting the Wonders up with first and goal at the one. 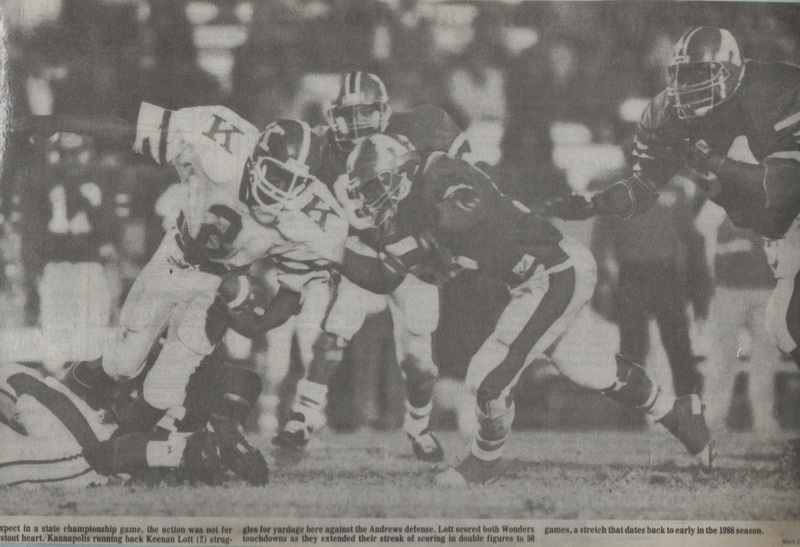 Junior runningback Keenan Lott on first and goal would take it the final yard for the last score of the game. 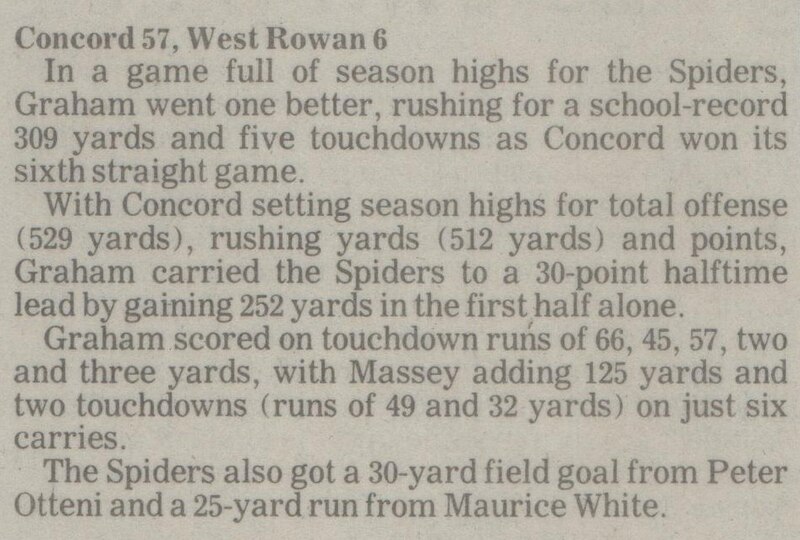 The PAT would be good and the Wonders would put the Spiders on ice 21-7. The seconds tick off and the celebration begins. 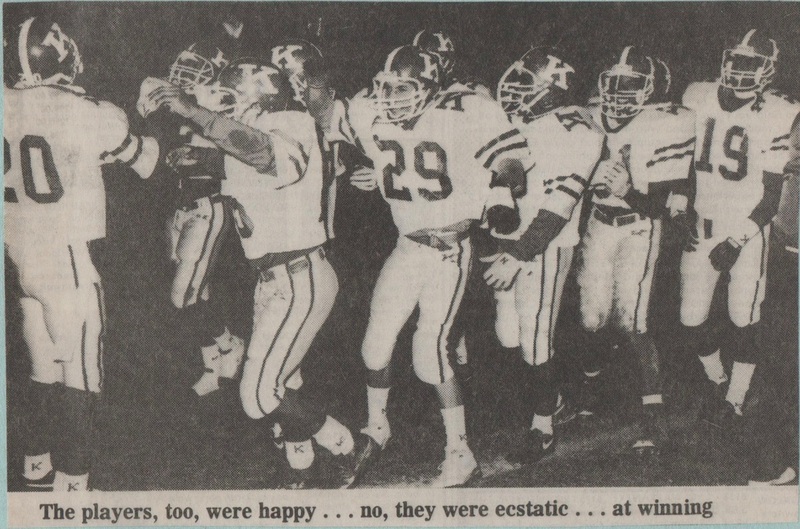 The memory of the 30-20 defeat three weeks earlier disappear into the cold November night as the Wonder earn a ticket to the State Championship game in Chapel Hill. TV-13 Commentator Larry Mason talks with player of the game Wonder runningback Keenan Lott after the semi final game with Concord. Lott gives his thoughts on the game and the return trip to Chapel Hill. 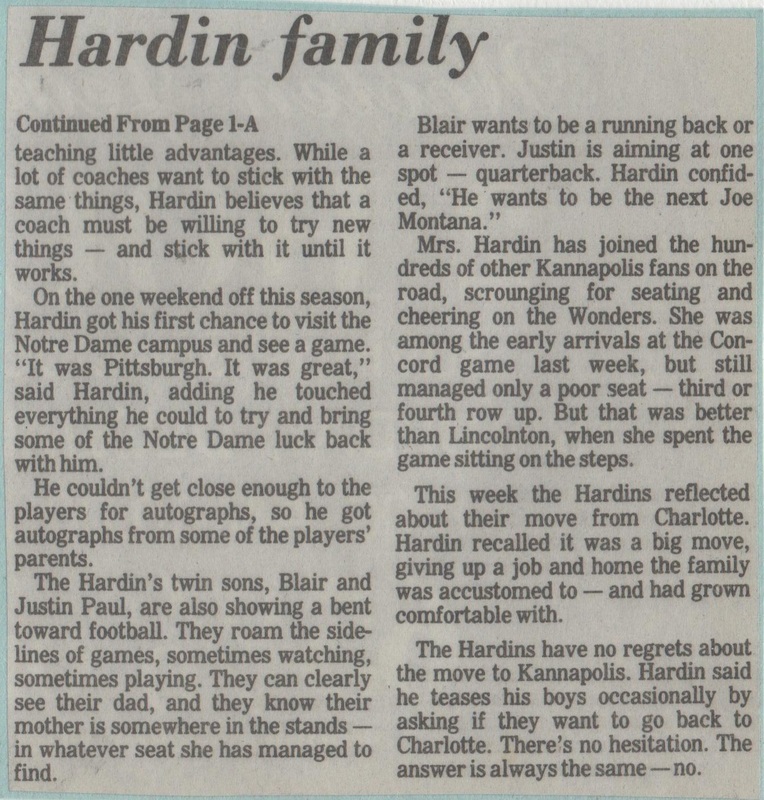 In a special State Championship edition of Headliners head coach Bruce Hardin talks about playing the state title game in Chapel Hill. 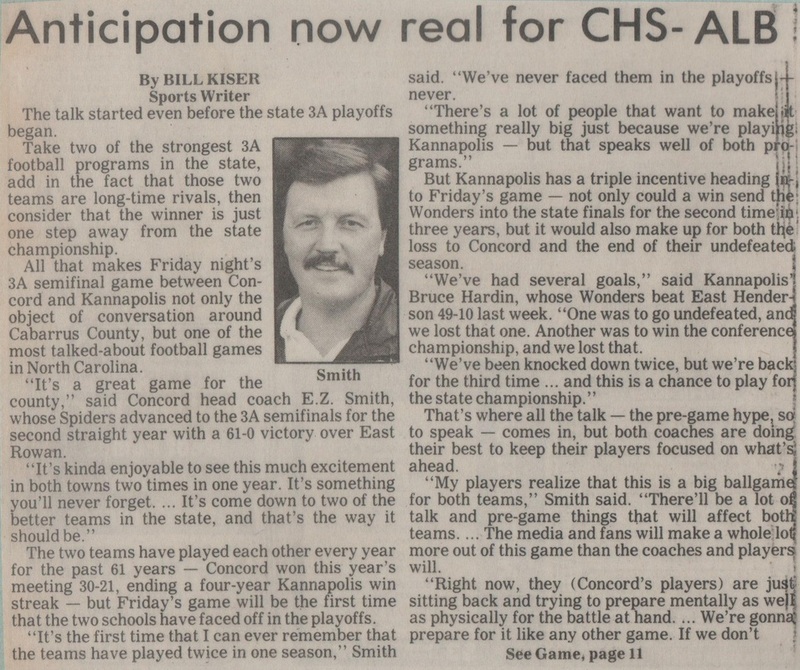 Coach Hardin introduces assistant coach Buddy Amerson, Video and equipment manager Terry Berryman and the late Jimmy "Smittie" Smith about their roles in the state title game. 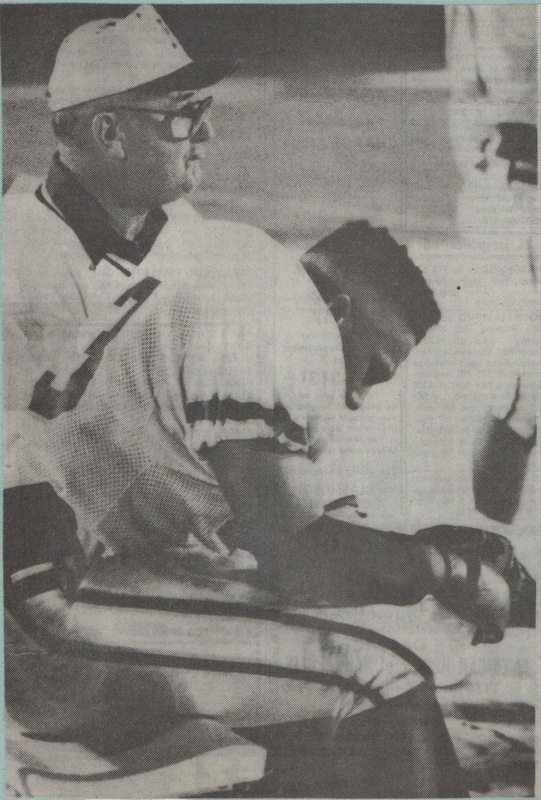 In the late Jay Vaughn's last public interview Coach Hardin asks him about the status of the linebackers for the state title game. 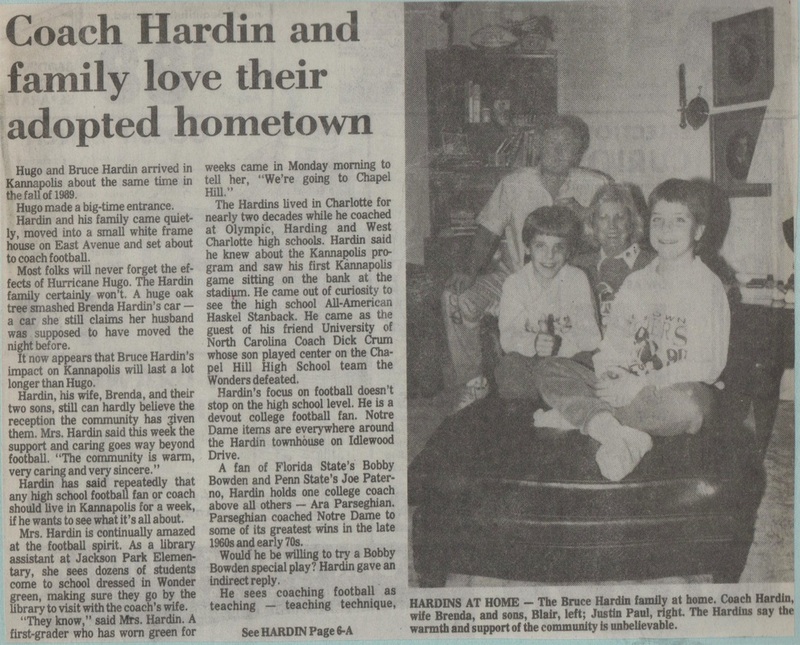 A very young Justin and Blair Hardin join their dad head coach Bruce Hardin on the set of Headliners in the special State Championship edition in 1991. Justin and Blair would later play ball for the Wonders. 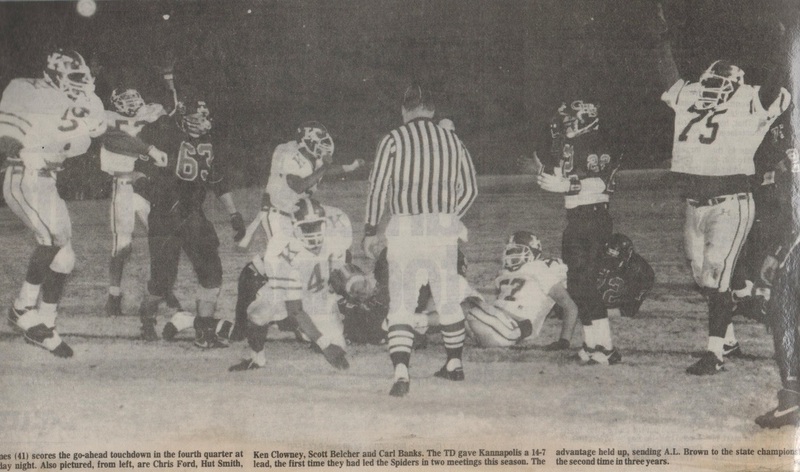 The TV-13 Game of the Week would be the 1991 State Title game live from Chapel Hill North Carolina. Randy Whitley and Larry Mason present the pre game color commentary. 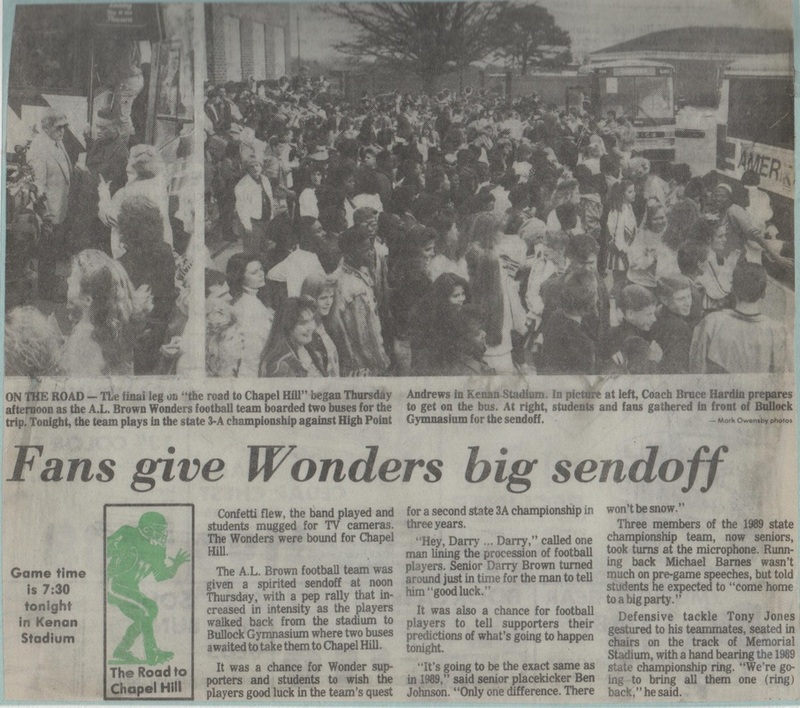 As the 1991 State Title game began the Wonders would lose the coin toss, and T.W. 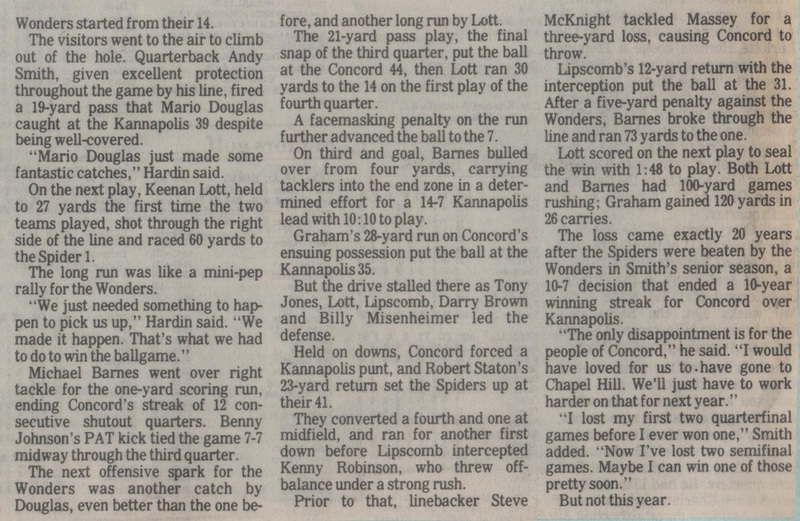 Andrews would choose to defer to the second half giving the Wonder offense the first crack at striking first. As the the Wonders took the opening kickoff it would appear that lightning would strike quick and this would be the night for the Wonders. 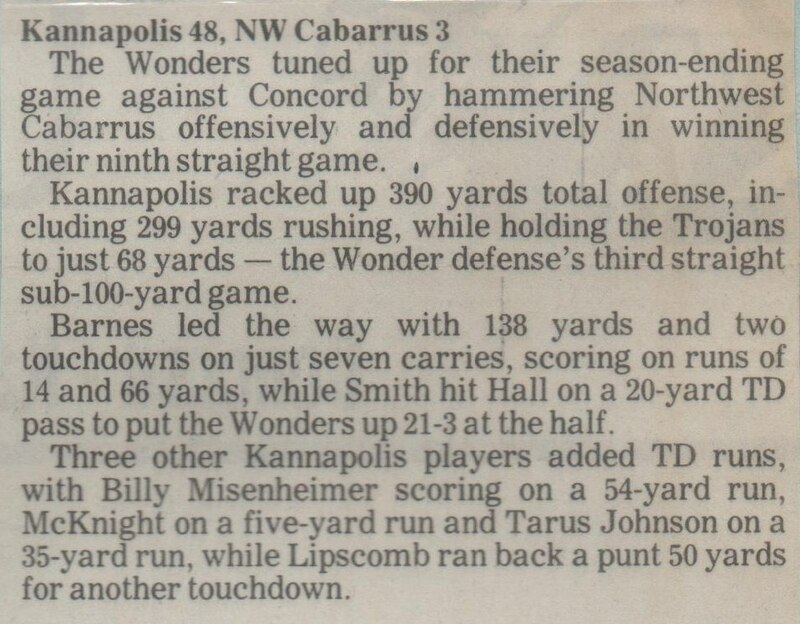 After a spectacular kickoff return by Barry Lipscomb the Wonders took only two plays and thirty three seconds to get into the end zone. 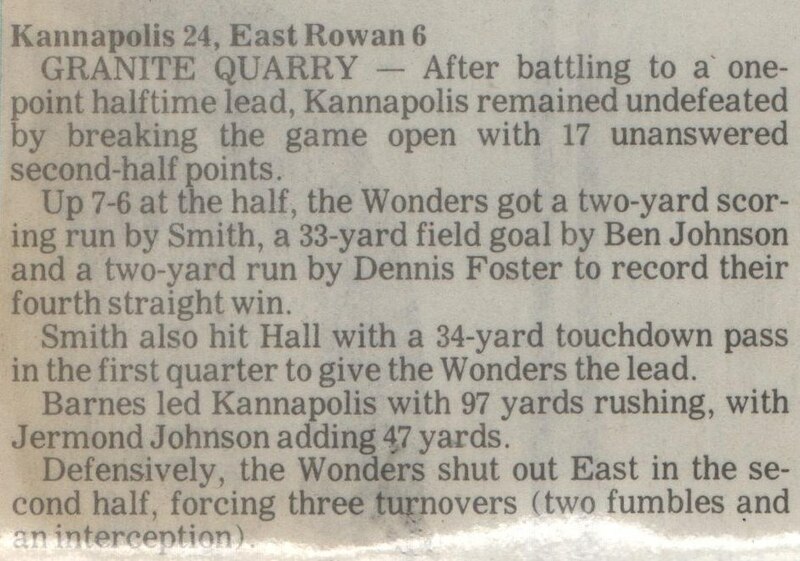 Wonder back Keenan Lott would take the pitch from QB Andy Smith and break off a fantastic thirty one yard TD run to put the Wonders up early 7-0 with 11:27 left in the first period. After making the Red Raiders go three and out the Wonders got the ball again and looked to be on their way deep into Red Raider territory when disaster struck. 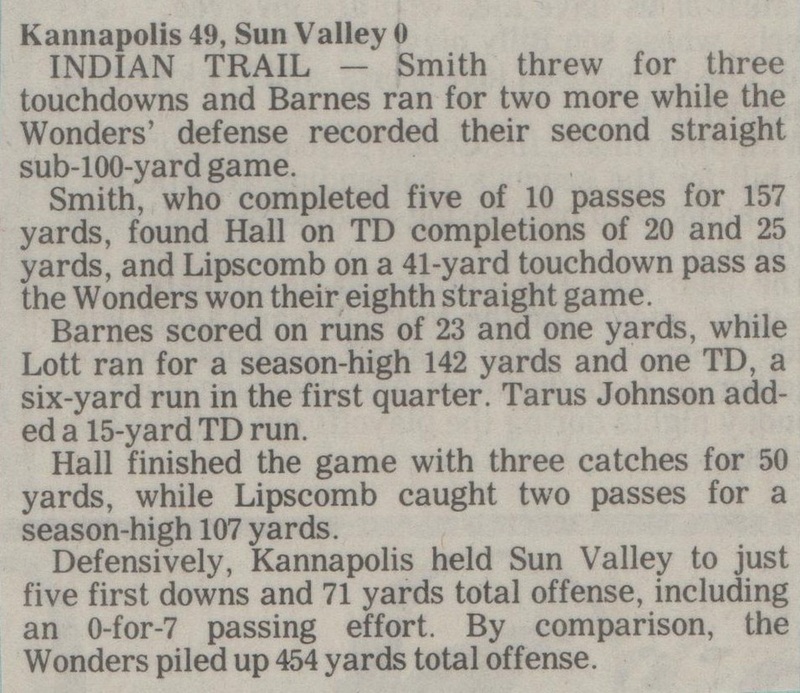 QB Andy Smith misreads his receivers route and throws an interception that falls into the hands of one of the quickest players in the state. Red Raider two way starter Darius Brewington would take the interception 83 yards for the Red Raiders which after the PAT would tie the game at seven with 5:51 left in the first period. As the second period began the Wonders were threatening yet again to score as they drove deep into Red Raider territory. 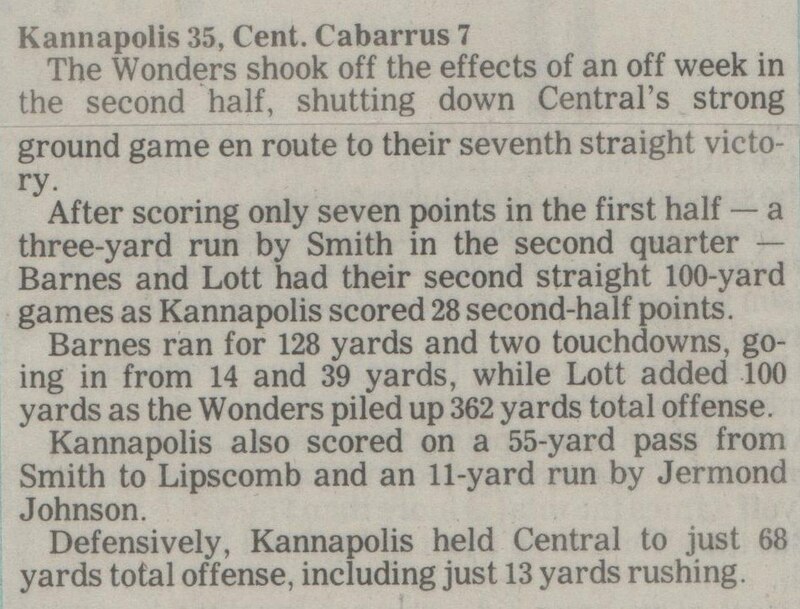 Wonder back Keenan Lott would take the ball on a delay and scamper twenty four yards for the Wonders final score of the evening. Ben Johnson's PAT would be true and the Wonders would take their last lead of the evening 14-7 with 11:31 left in the first half. 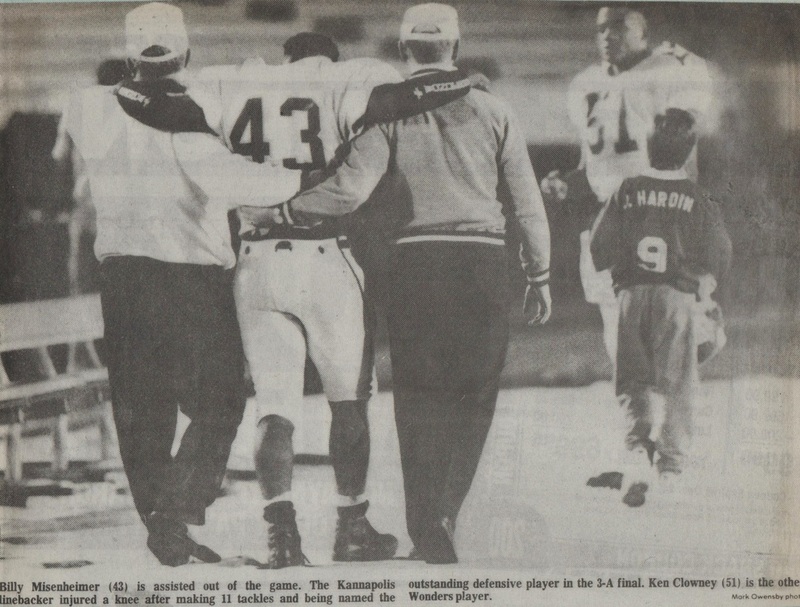 On a nine play seventy two yard drive Red Raider QB Seung Yu would connect with receiver A. Green on a six yard TD pass with 8:04 left in the first half to tie the game once again at fourteen. 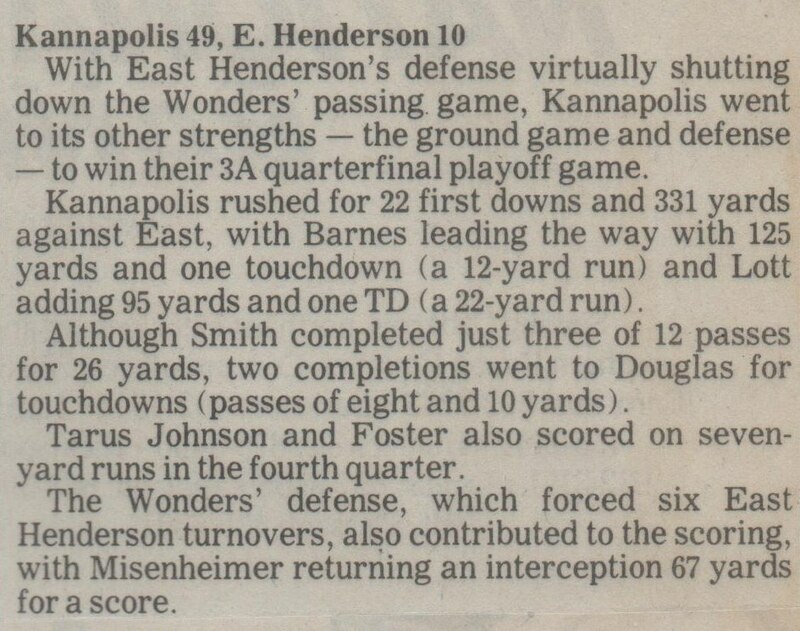 The Red raider offense would begin to flex their muscle as the Wonders defense could not get the stops they needed. With thirty three seconds left in the half Andrews kicker Adam Perriman would nail a thirty four yard field goal to put the Red Raiders up 17-14 before the half. This would be a lead they would not relinquish for the remainder of the game. 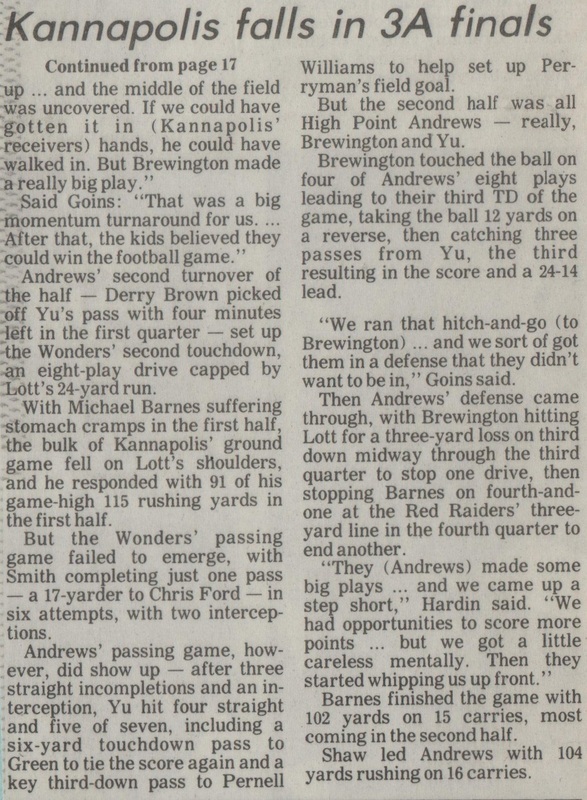 Andrews final score of the game to put the nail in the coffin came with 8:25 left in the third quarter as Red Raider QB Seung Yu would connect with receiver Darius Brewington on a twenty eight yard touchdown reception to ice the Wonder after the PAT 24-14. So close, yet so far! 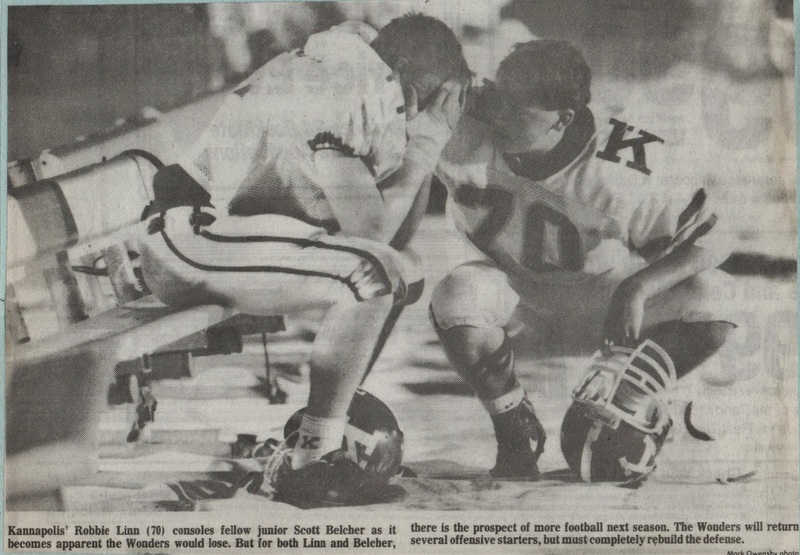 The Wonders stand dejected as the clock winds down the final seconds of the 1991 State Title game. 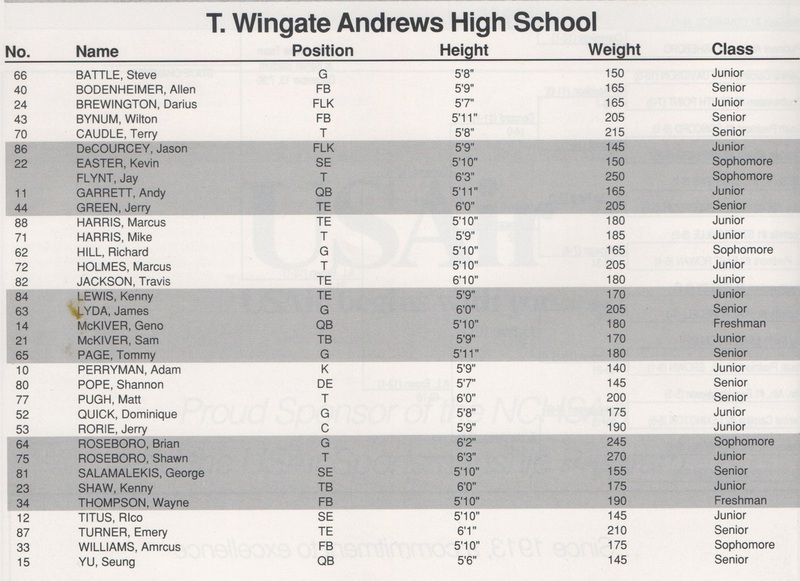 The Red Raiders of T.W. 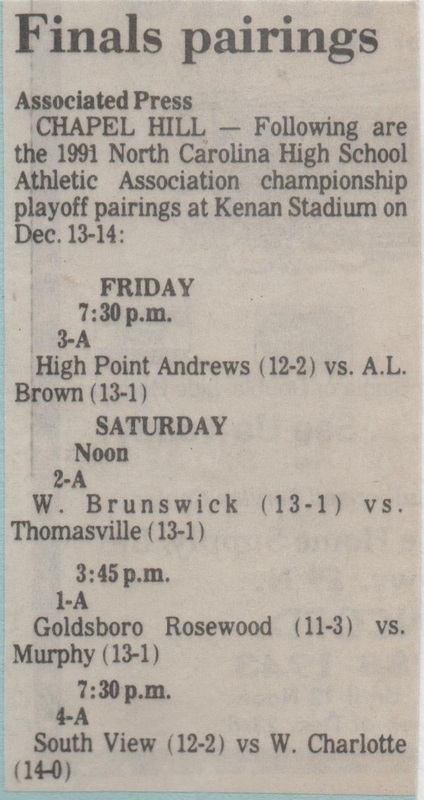 Andrews would become the 1991 State AAA Champions as the Wonders have to settle for being second best in the state. 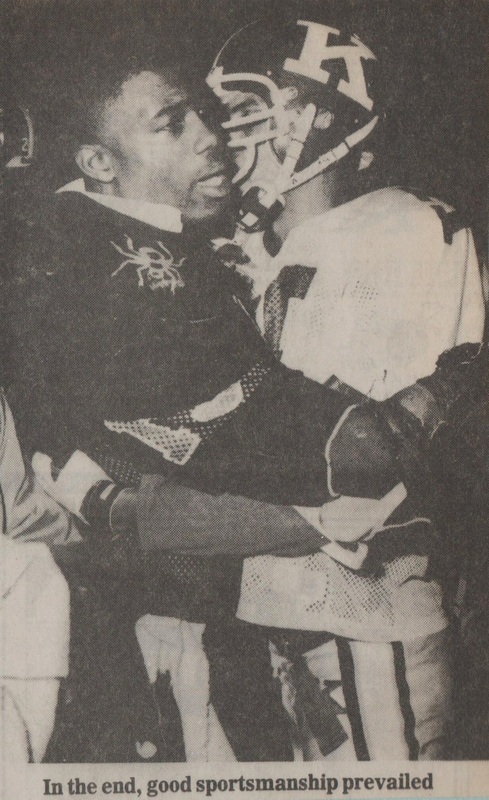 TV-13 color commentator Larry Mason talks with T.W. 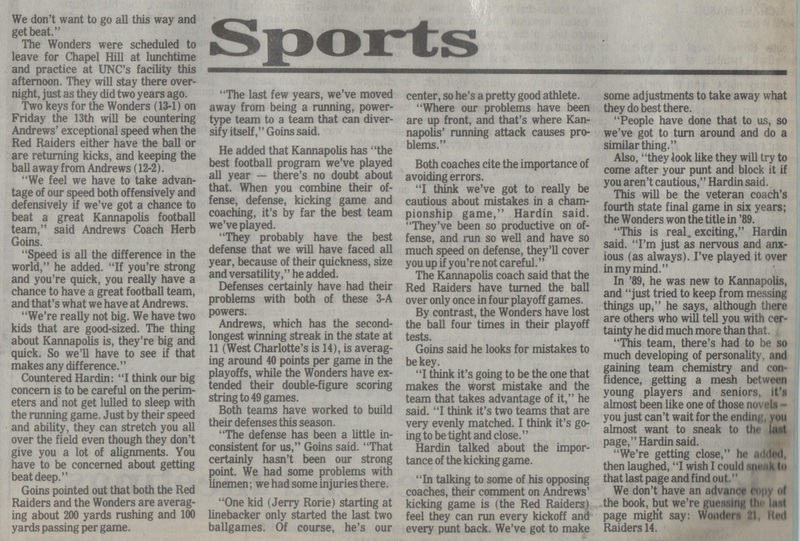 Andrews head Coach Herb Goins on his victory over the Wonders in the 1991 State Title game. 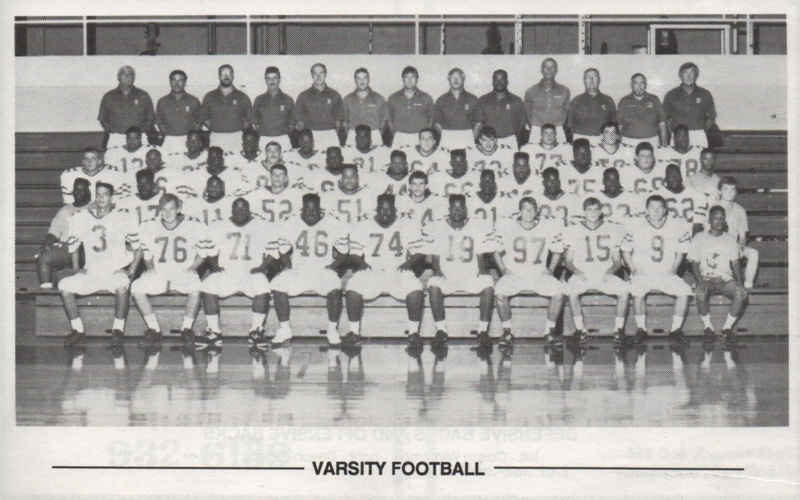 This would be coach Goins last game as head coach of the Red Raiders. 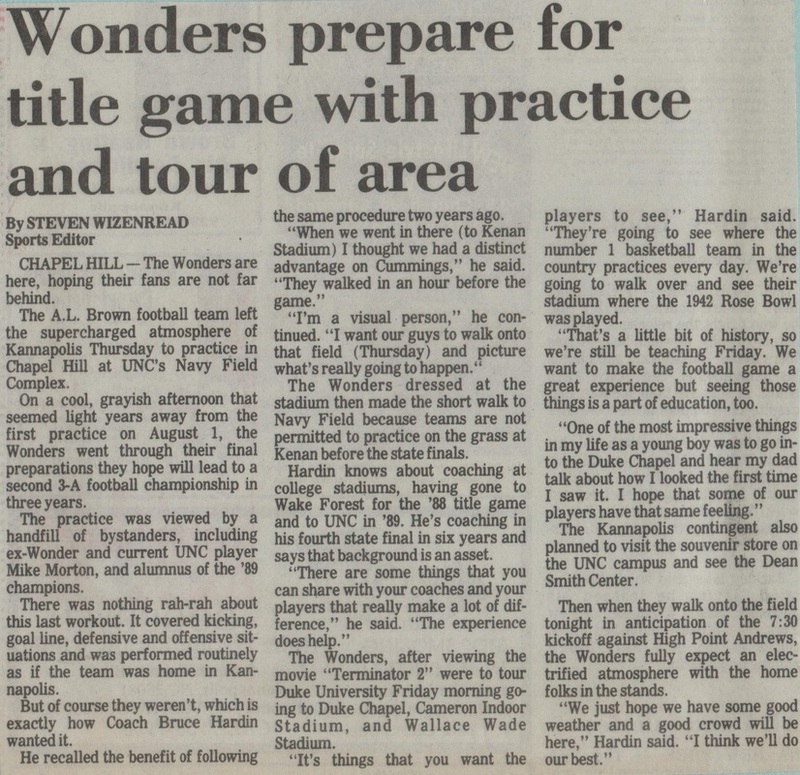 And so on a crisp December night in Chapel Hill the Wonders learned that a great effort alone was simply not enough. 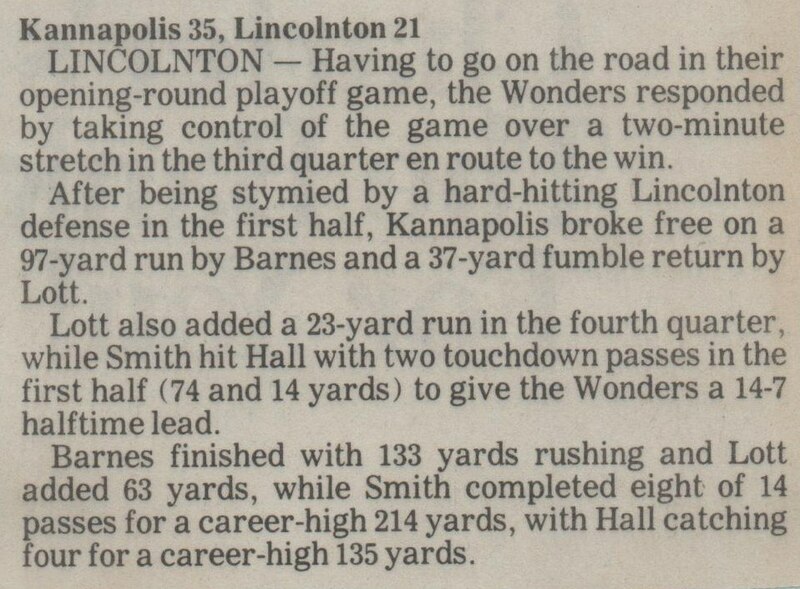 The Wonders had played valiantly throughout, but missed opportunities sunk the Wonders in the second half. T.W. 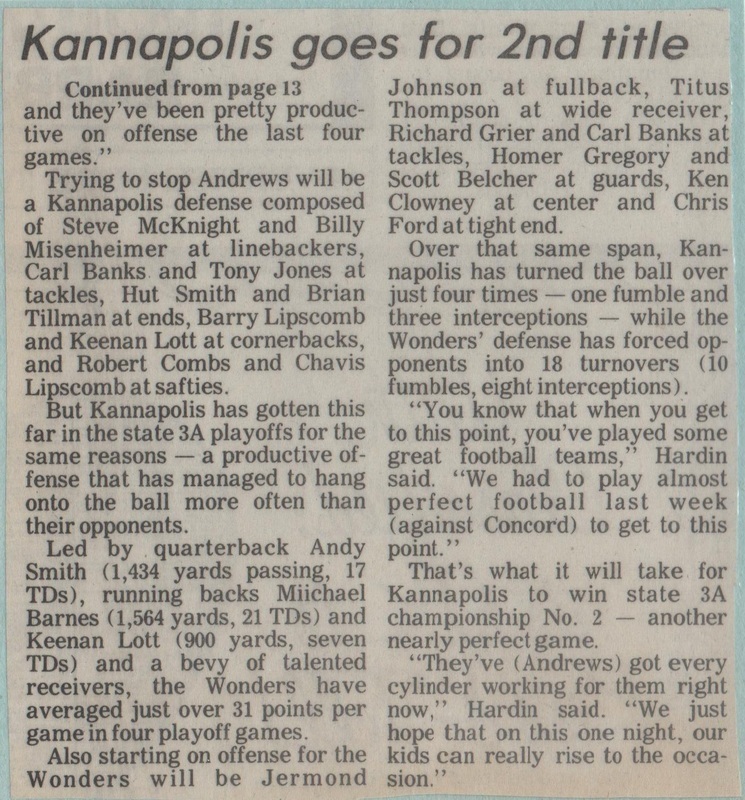 Andrews would walk off the field the State AAA Champions for 1991 sending the Wonders back to Kannapolis far differently than they left in 1989. It was a long ride home for the Wonder faithful as each mile that passed left the Wonders thinking of what might have been. It's difficult to say the least to get that far only to come up ten points short of the goal. 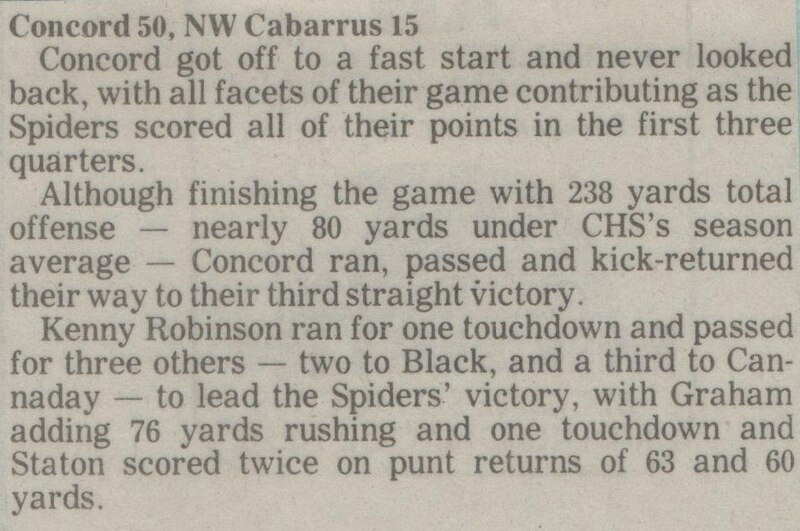 The joy of defeating Concord in the state semi finals paled in comparison to the feeling of defeat in Chapel Hill. 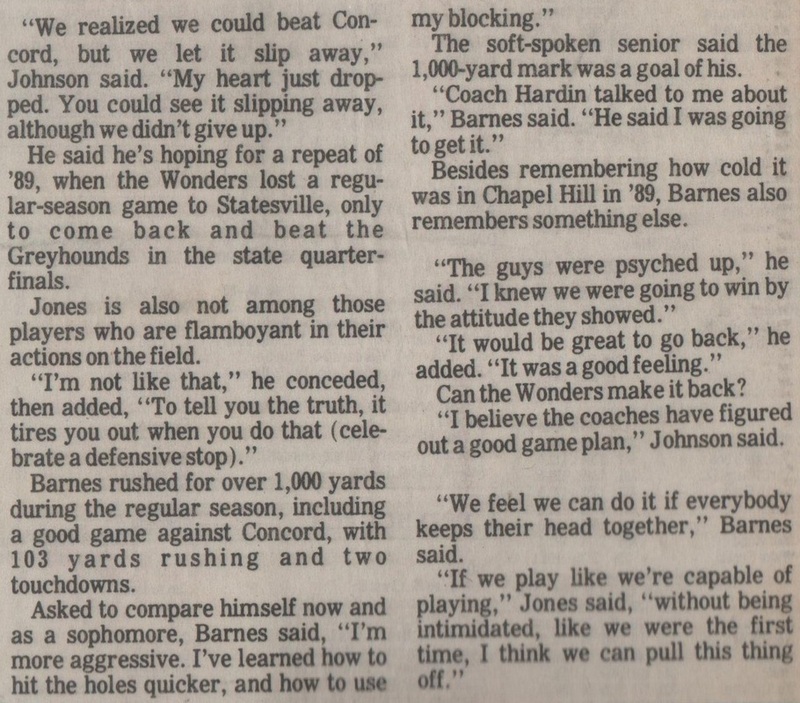 Though the Wonders came up short in Chapel Hill they learned a lesson in defeat that some never learn in victory, and that is it's not how you play the game, but rather that you play the game. 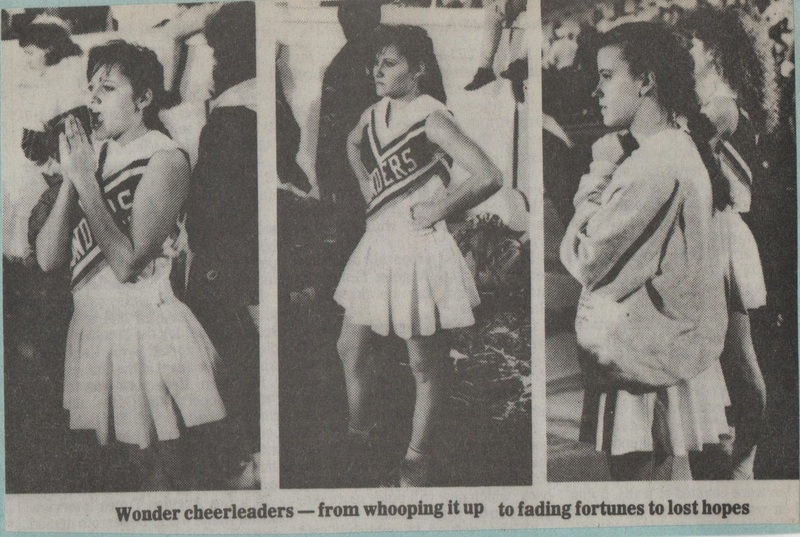 The Wonders were far from being losers. They started off the season with many doubters and made believers out of all of them by seasons end. 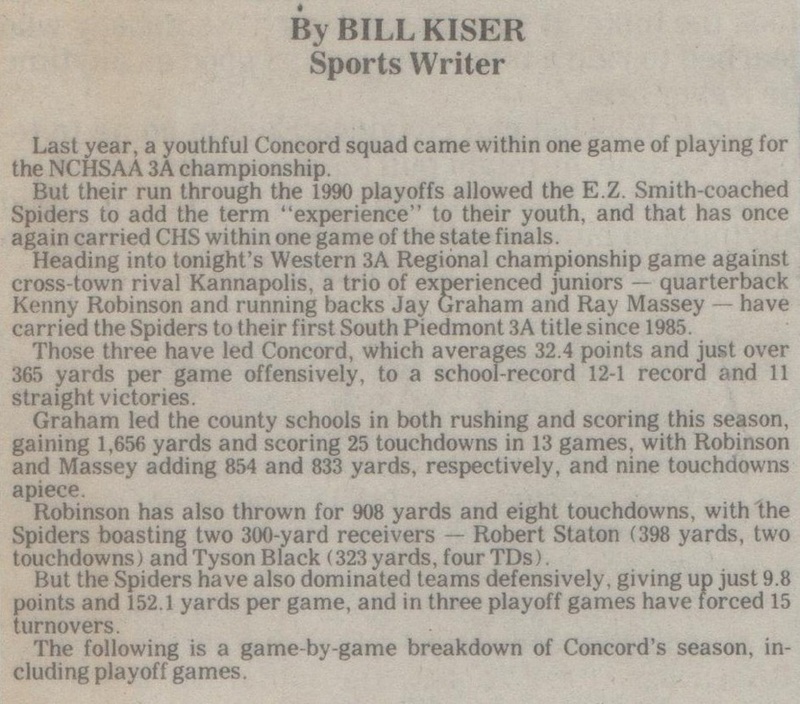 This group of underachievers would quickly silence the critics as they traveled the road to victory through most of the regular season falling only once to Concord 30-20. 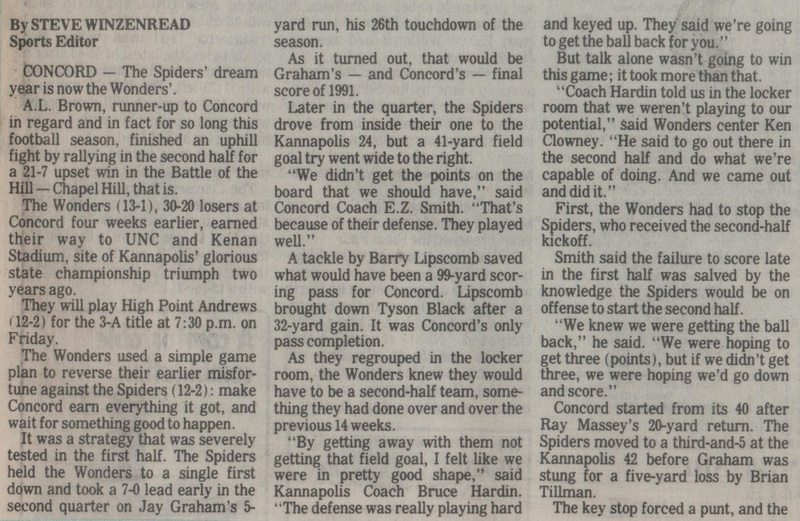 That loss however would prove to be the medicine needed to get the Wonders back on track to completing a glorious playoff run that saw them get sweet revenge on the Concord Spiders that effectively knocked them out of an opportunity to play for a state title. Can't get any better revenge than that. For one year the loss of the bell meant very little in the grand scheme of things for the Wonders. 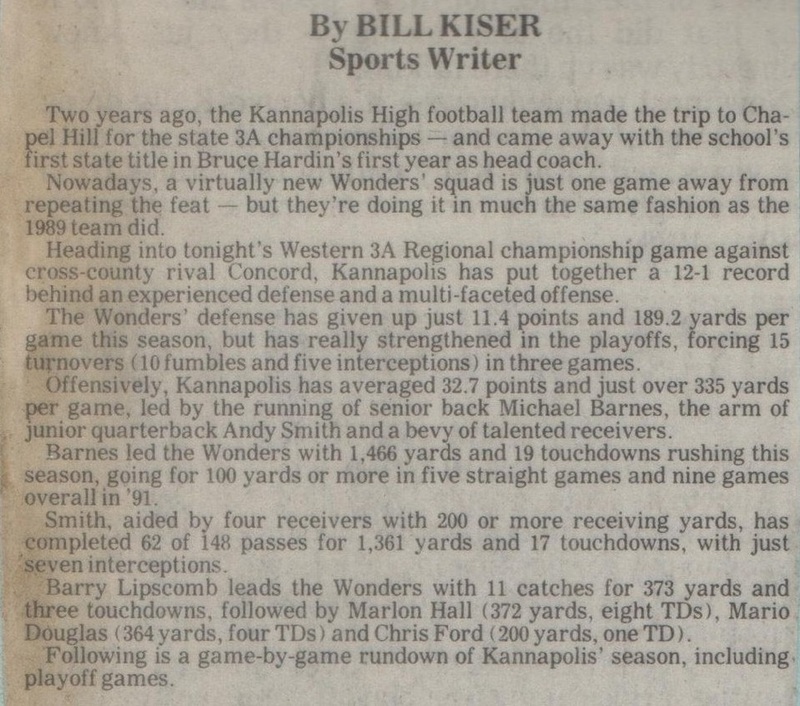 The 1991 Wonders will forever be known as the state AAA runner up, and that's fine for the record books, but more importantly the 1991 Wonders will be remembered as a team who never gave up and trusted in each other rather than listen to the doubters. 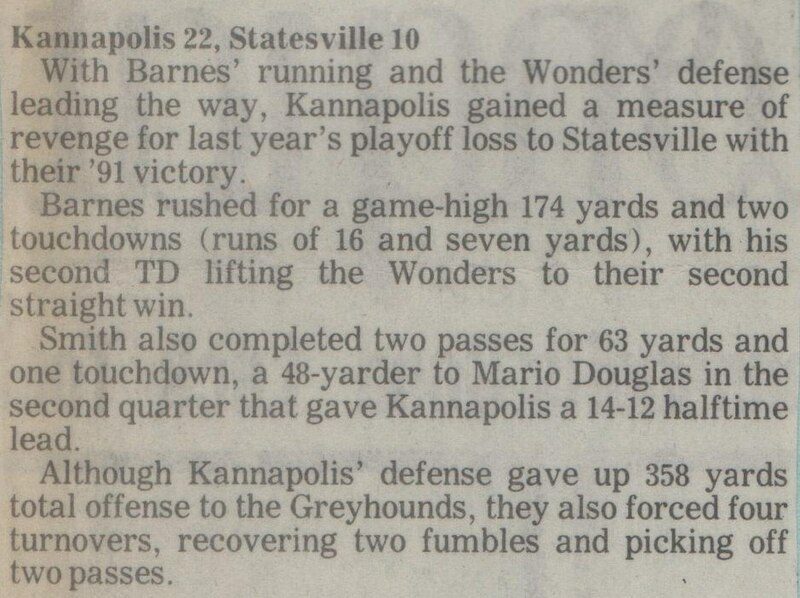 The 1991 Wonders will always be considered one of the greatest Kannapolis football teams to ever play the game and for that they hold a special place in Wonder football history.